Half way through February, it seems a little odd to be wishing people a Happy New Year, but the first 4 weeks back in the DRC have whooshed past and everyone looks to be very busy designing and building. Two of Mullum Creek’s residents have already moved in and celebrated Christmas in their new homes! Landscaping of the reserve area is continuing in Stage 1, with planting to follow in the coming weeks, once the hottest and dryest weeks of Summer have passed. We hear many compliments about the beautiful work that Australian Ecosystems has underway with your reserves and nature strips, and it’s in all of our best interests to look after these finished areas by reminding builders, subbies and materials deliverers to be careful with their vehicles on the estate. A formal update of civil construction works for Stage 2 will be issued by Verve in March. Also thanks to Verve for providing us with this series of aerial images of Mullum Creek taken from 2009 to 2018, linked here! As construction of homes in Stage 1 continues in leaps and bounds, the DRC has become aware that lot owners are often finding it difficult to organise their boundary fencing individually. We suspect this is because fencing contractors may be reluctant to establish themselves on site with all their equipment to erect only a few quite short fence runs required for a single lot. We’ve spoken to a few prospective fencers and confirmed with them that, if they can fence a group of lots in one job, their willingness to quote will go up and the prices they quote per unit fence length will come down. And so we are taking expressions of interest from Stage 1 residents until 22 February for a group fencing trial. Thanks to everyone who has responded so far. If there is anyone else who is interested, please let the DRC know. If the trial is wildly successful, as we are hoping it will be, we will do it all again when think another group of lot owners is ready to fence, both in Stage 1 and Stage 2 of the estate. The ground slab insulation guide? 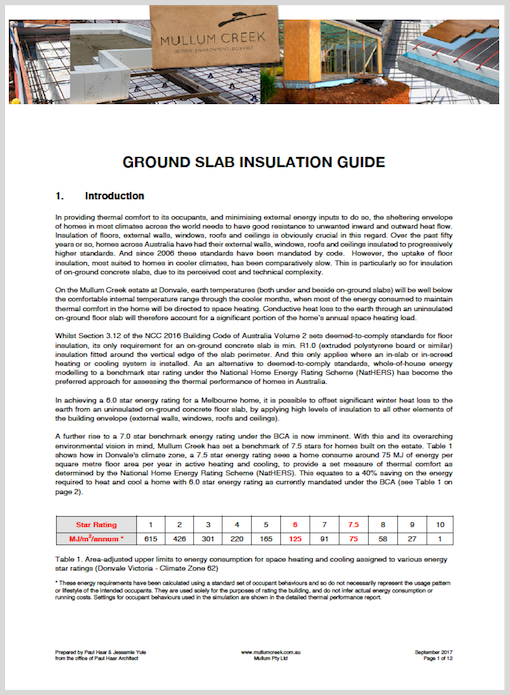 If your Thermal Performance report from Floyd Energy requires that you have ground slab insulation to achieve our benchmark 7.5 star energy rating, we recommend you give this a read… The Step 3 Checklist? 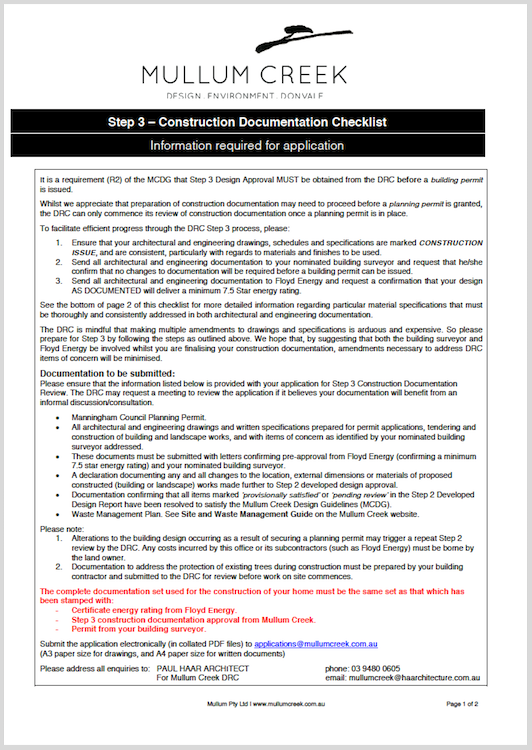 If you’re soon looking to submit to the DRC for Step 3 review of your construction documentation, it’s very important that you closely follow this checklist so that your final design approval proceeds smoothly. There are a good handful of lot owners who are now engaged in detailed design development and are likely to be thinking about selection of building services. This guide has details on manufacturers, warranties, cell types, size and prices for solar panels. Attracting over 100,000 visits annually, the Festival engages with hundreds of organisations and individuals to stage Australia’s largest sustainability festival. The Festival’s month long program engages individuals and communities to host and promote sustainability events. Celebrating the very best examples of ecological and social sustainability the event embraces interactive workshops, talks, demonstrations, artworks, exhibits, films and live performances. A beginners guide to household solar. Learn how solar enables you to cut the cost of your bills by generating your own electricity. This is a free event, but a booking is required to secure your place, click here to book. In this information session, presented by Arvio (designer of the home under construction on Lot 27, owned by Anne Marie and Pierre), you will learn how to build a solar generation and storage system that, unlike a conventional system, keeps providing power, even during an electricity blackout. 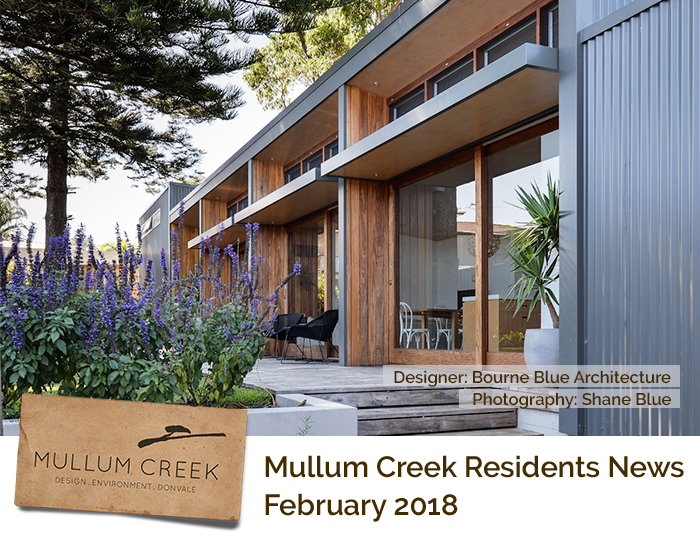 Mullum Creek is located on Wurundjeri country. We acknowledge the Wurundjeri people as the Traditional Custodians of the of the land and respect their continuing connection to land, water and community. We pay our respects to them and their cultures; and to elders both past and present.